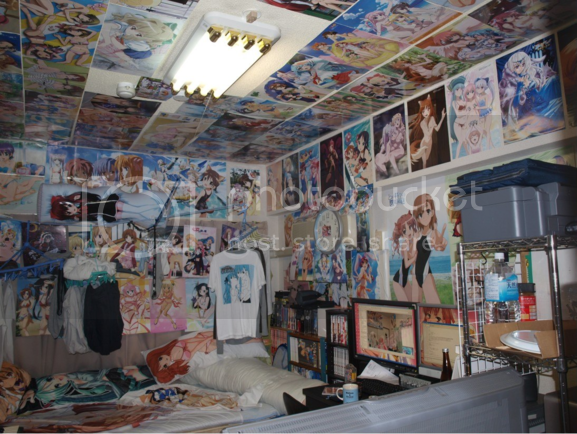 A peek into an otaku's bedroom or living space can be a bit of a surprise for the average person. But it's not unusual for fans of anime and manga in Japan to decorate their small rooms even more elaborately. Otaku rooms can be covered in posters and pillows or shelves with hundreds of collectible figurines, all emblazoned with favorite anime or manga characters. Some fans make a point of collecting as much merchandise associated with the object of their affection as they can, and making sure it's all on display. It's a form of decorative expression that many otaku in the rest of the world have also adopted. You might have seen it in the Japanese drama "Train Man," the main character's bedroom is crammed floor to ceiling with shelves of statues and figures from popular anime series like "Mobile Suit Gundam" and stacks of manga. Let's be clear: This is not "normal behavior" in Japan. While the otaku population is strong there, Japanese who get involved in any fandom to this degree earn a certain amount of disapproval from others. Some are reserved about letting people see their personal space because of it. In his new book, "Otaku Spaces," author Patrick W. Galbraith digs even deeper into the way otaku choose to decorate their surroundings, and the reasons why they choose to do so in the way that they do. Just like American collectors, comfort plays a key role in why they choose to collect. "Whether we look at bedrooms, stores or even neighborhoods where otaku hang out, it seems almost as if there is a colonization of space by interests," Galbraith said. "Whatever it was that interested them, they could encounter it anywhere and anytime in daily life, increasing feelings of intimacy. The more they consumed, the closer they felt to favorite series, characters or moments."